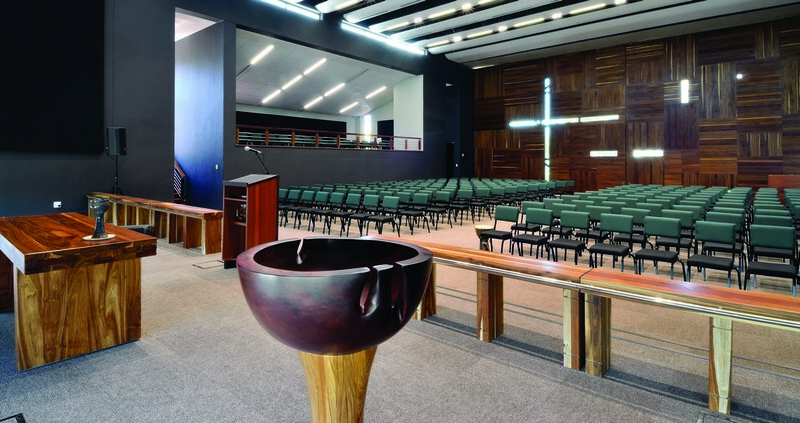 The Seth Mokitimi Methodist Seminary in Pietermaritzburg, South Africa is an award winning institutional building, designed by SA-based Boogertman and Partners. 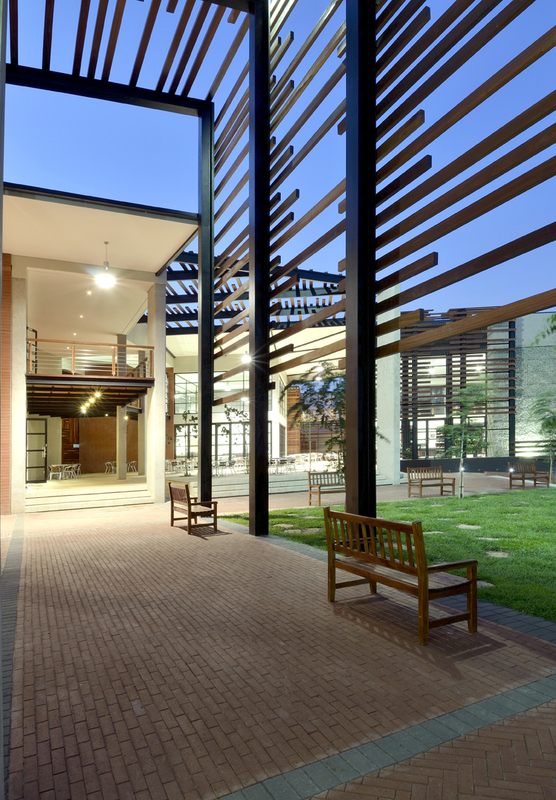 Completed in 2010, the Seminary features a series of spaces/buildings arranged in a triangular layout connected by shaded passages. 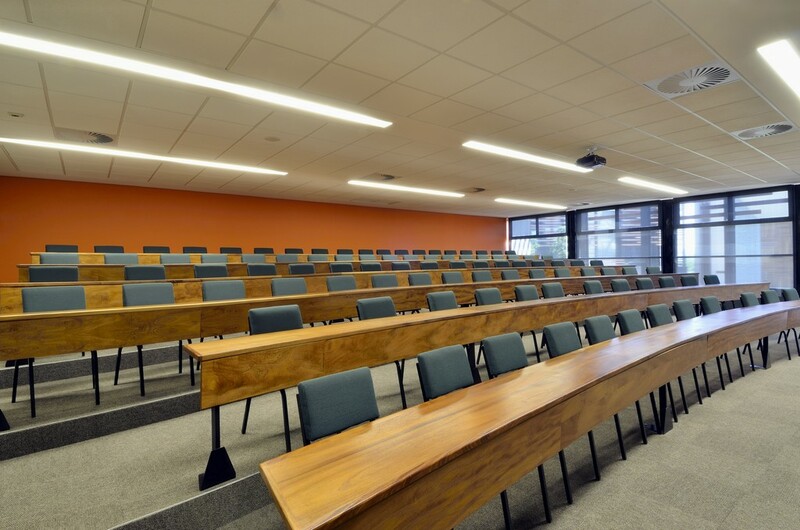 These include a 300 seat Chapel (Chapel of Christ the Servant), a Library and information Centre (The Nelson Mandela Library), an amphitheatre, a Refectory as well as an administration Block comprising six 75 seater lecture halls, flexible enough to host other functions. The exoskeleton of the structure becomes an acoustic buffer from the traffic on Golf Road- a hard shell with an inner softer core (Witbooi 2010). 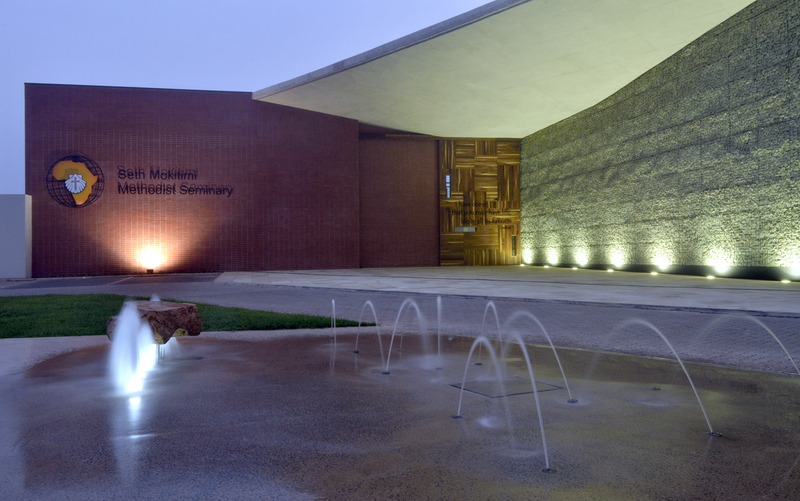 At the main gate into the sacred space, located south adjacent to the Epworth School, one is greeted by a noble water feature. This low lying fountain is a present reminder of a long and expensive heritage dating back to the 19th century (Witbooi 2010). The stone at the fountain was brought back from Bethlsklip, Namaqualand, where Rev. Barnabas Shaw (Pioneer of Methodism in South Africa, from Britain) first, defiantly preached to the indigenous in 1816. 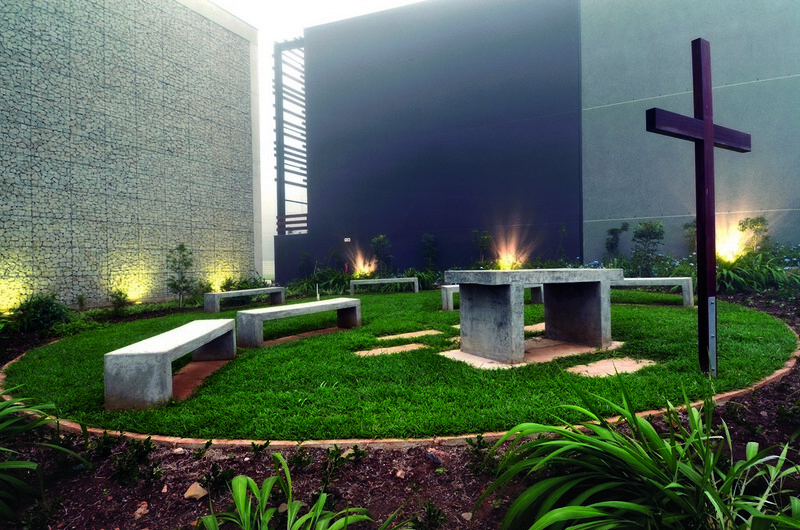 An additional twelve embedded water spouts represent the twelve districts of the Methodist Churches of South Africa (Witbooi 2010). Topographically, the site has a significant fall from the west (Adjacent to the Epworth School) to the east buffered by residential dwellings. 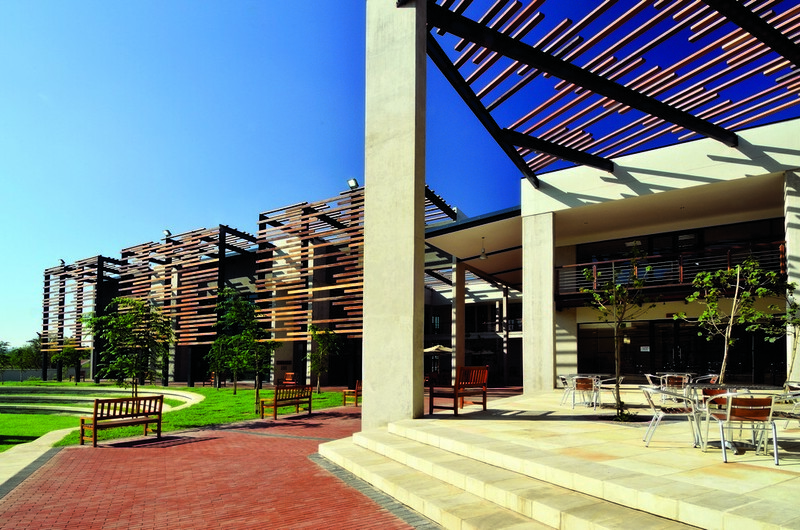 North of the structure overlooks the school’s playground; the south is bordered by Golf Road, sharing this street with the University of Kwa-Zulu Natal(UKZN) (Witbooi 2010). The site is short of trees, furnished mainly by lush green veldt- a representation of the Kwa Zulu Natal landscape od green valleys and hills (Witbooi 2010). On approach towards the man entrance to the seminary, a cantilevered trangulated prism canopy hovers over the entrance- in reference to the holy trinity (Witbooi 2010). 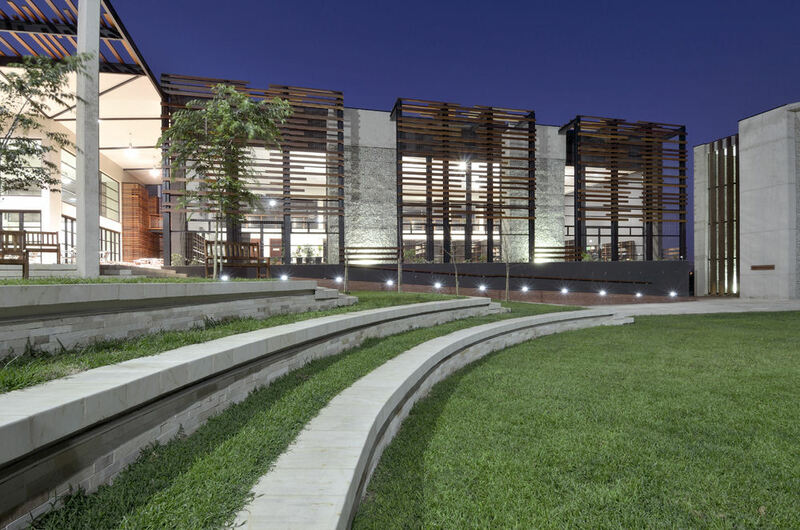 The scale of the building is lowered, submerged into the ground to respect the residential scale and acknowledge to school’s presence, being sympathetic and an influenced neighbour of the historically significant building. At first the building appears to be of human scale, though the gigantism is soon revealed as one moves closer and becomes more intimate. 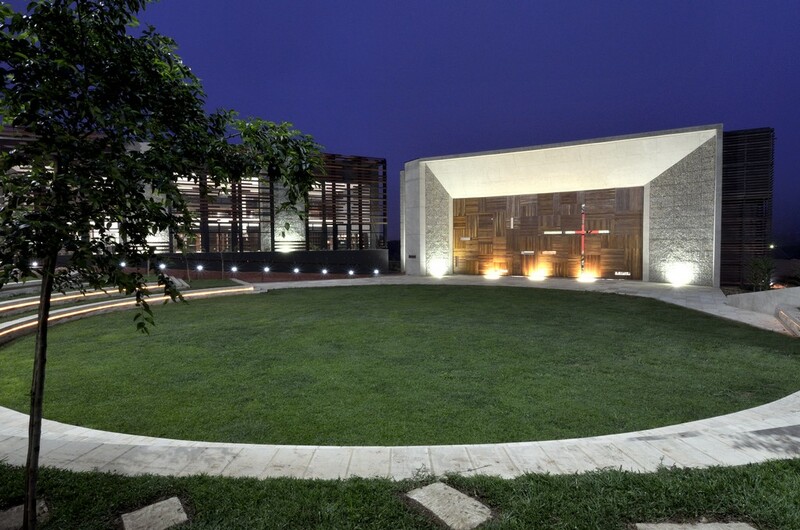 The slope, on which the building sits, facilitates transitional movement between spaces- hierarchal: from secular to entrance building to most sacred (chapel). Witbooi (2010), states that the height of the roof of all the spaces is at the same level throughout the building, with only the tower at the amphitheatre extending beyond the summit. 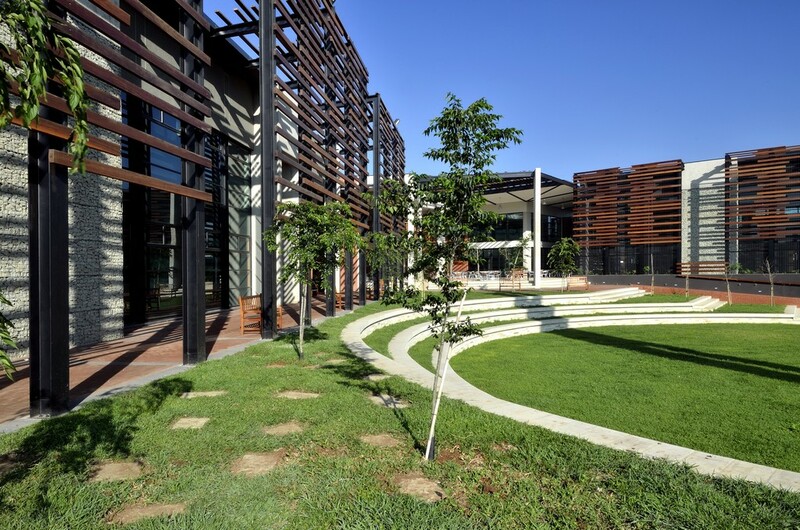 Influenced by the UKZN Neo Brutalist concrete building defined by strong linear geometric and rigid minimalistic tectonic language, geometrically, the seminary is a series of buildings arranged in a triangular layout stitched together by cloistral passages (Witbooi 2010). In the centre the circular amphitheatre is defined by concrete steps that eventually disappear into the tower pointing towards the heavens. This tower is of precast reinforced concrete, left exposed and showing the steel rods subliminally through the gaps. 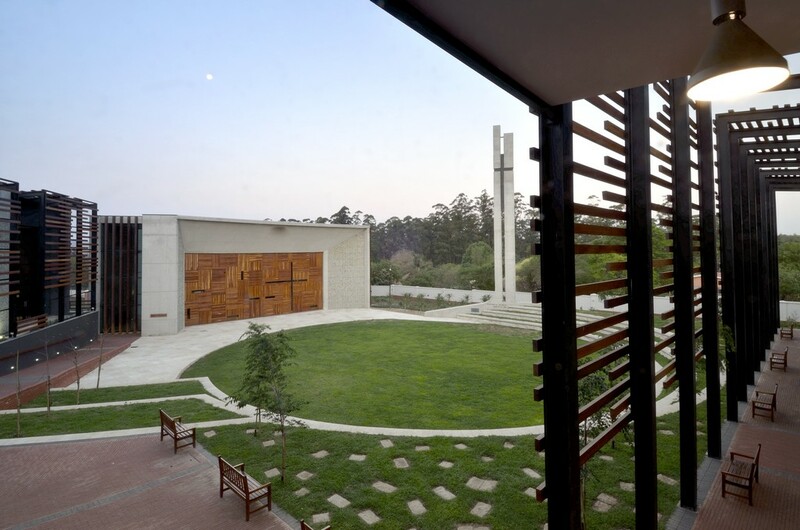 A laminated pine cross is placed at the intersecting openings- a juxtaposition of rough and smooth materials. 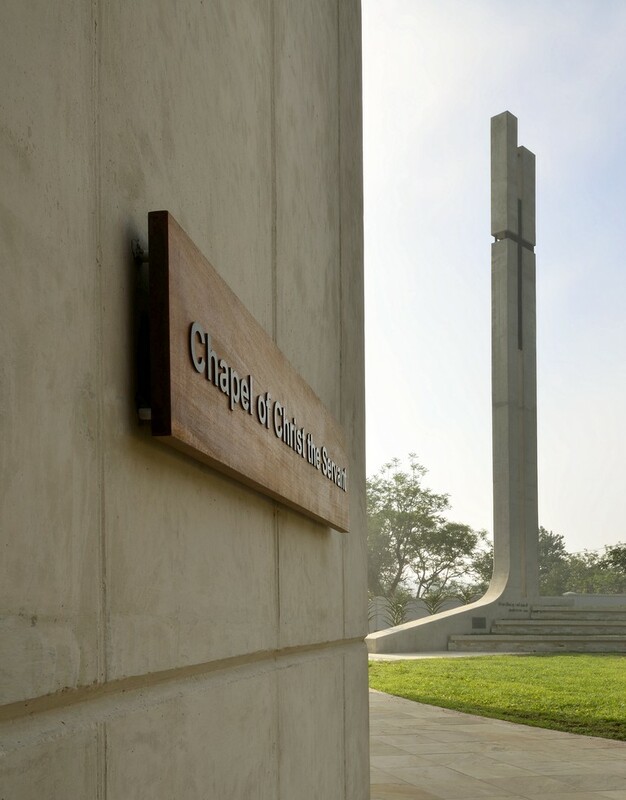 A further religious contextualisation is the inscription at the bottom of the tower: Chapel of Christ the Servent. The lighting around the amphitheatre seating culminates at the tower- the fire that led the children of Israel on the journey from Egypt to the Promised Land (Exodus 13: 20-22). 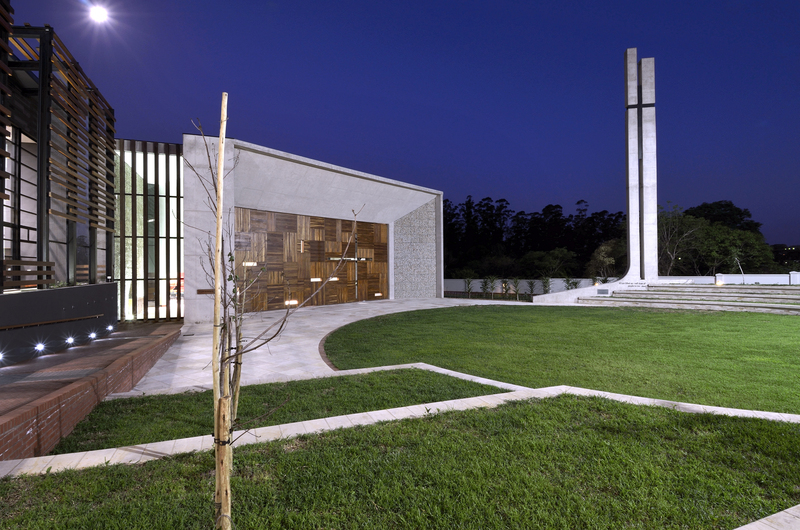 The exterior of the chapel lay as a combination of four materials: namely red brick; timber parquetted door; a stone gabion-like wall and a concrete triangular roof slab. 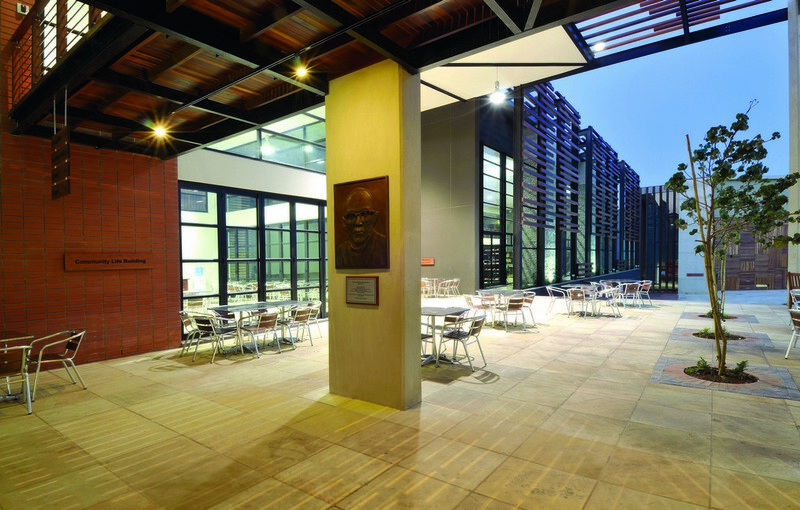 The Maritz burg red brick is reminiscent of the Anglican Cathedral of the Holy Nativity at Longmarket Street – an acknowledgement of local vernacular (Witbooi 2010). 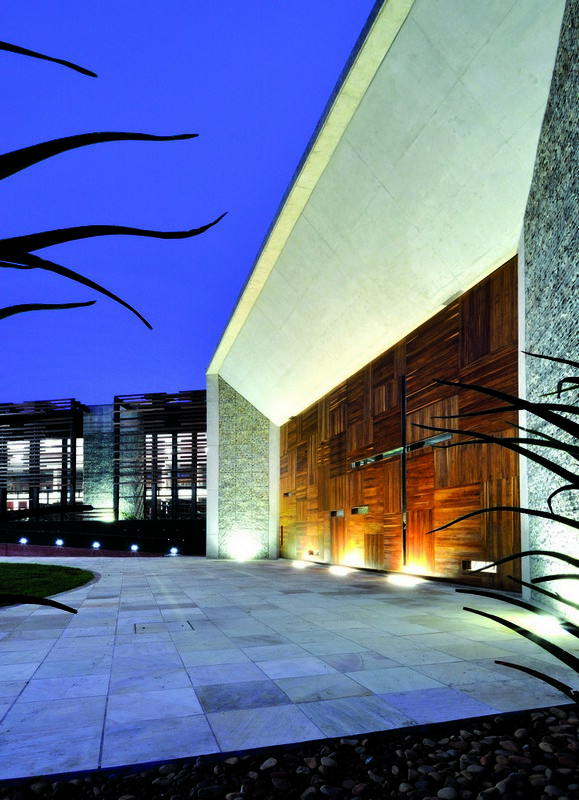 The stone gabion-like walls are fashioned throughout the structure. This is to allow for the penetration of natural light- a depiction of the presence of the Lord. 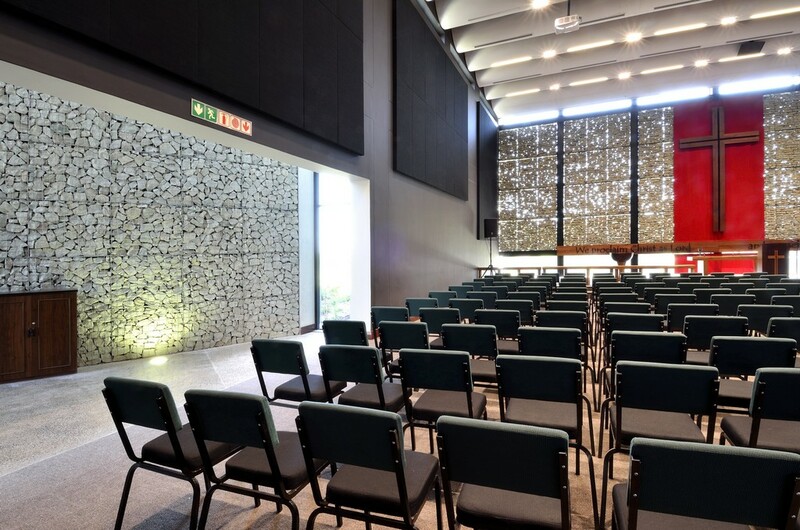 The chapel’s internal walls are clad with ash-grey sandstone tiles. Hung on these walls are textile rectangular textile panels. At the front of the chapel to the pulpit are suspended stone gabion-like planes. These planes are placed within a framework of warm grey finished I-beams. This plane appears to be suspended from the roof- the roof looks to be floating. This is reminiscent of Le Cobusier’s chapel of Notre Dame du Haut at Ronchamp. The load-bearing walls are connected to the roof by steel rectangular elements extending horizontally from the top of the wall to the underside of the roof forming openings. 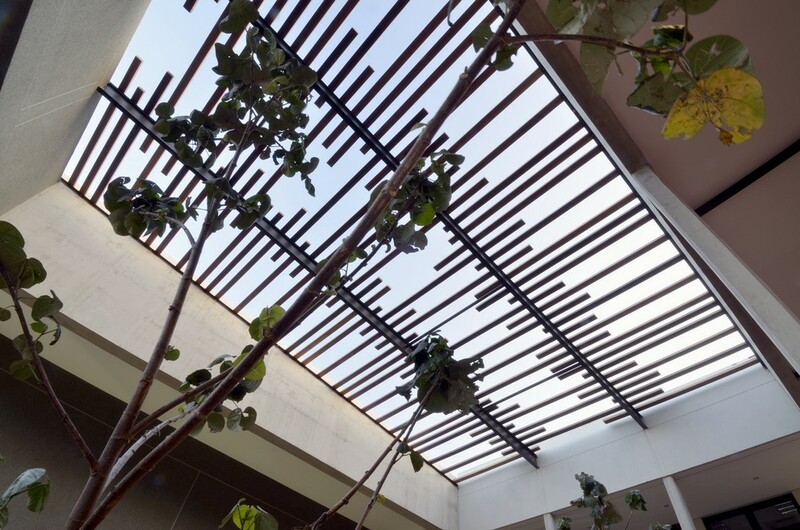 Light penetrates through the openings between the roof and load-bearing. A timber pulpit is placed at the front of the chapel covered by a purple velvet throw embroidered with a gold cross, a cross that resembles the timber version hanging from the gabion-like wall on a background of a red velvet textile. Under this is a rectangular timber panel inscribed: We proclaim Christ as our Lord and ourselves as his servants. 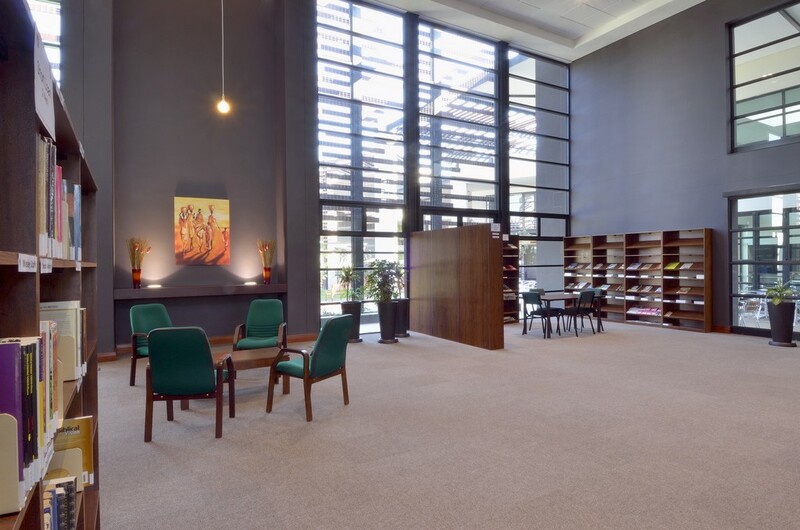 The floor finish is of a sand-brown carpet tile, adding to the natural aesthetic. 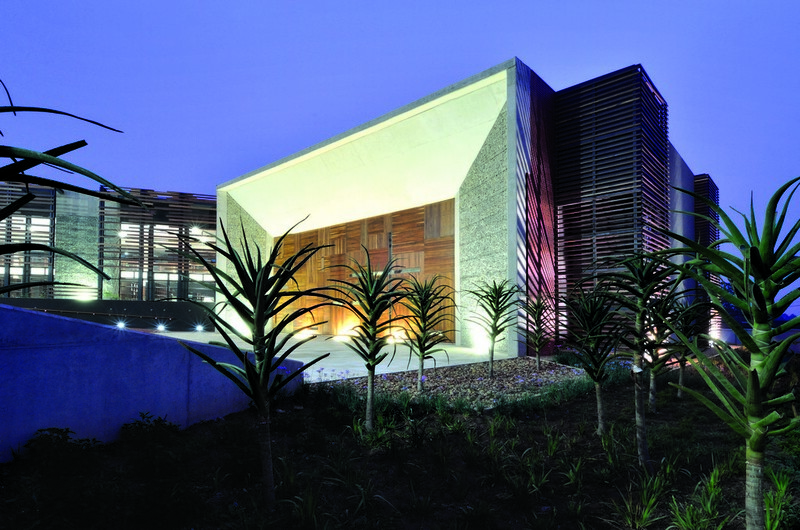 The materials are quite symbolic states Witbooi (2012): the concrete speaks of truth and exposure; timber of warmth and the gabion-like planes of mystery. The architect has considered the environment of a temperate region and adapted the design to these conditions- to facilitate the comfort of the user. 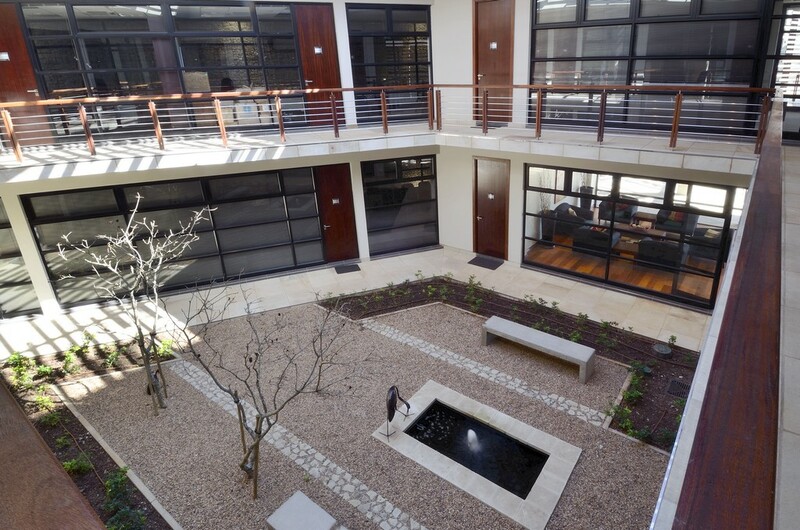 Ventilation, rain water harvesting and sun shading was taken into consideration (Witbooi 2010). Ventilation uses the concept of stack effect and opens up the façade at human scale level to maximise natural air flow. 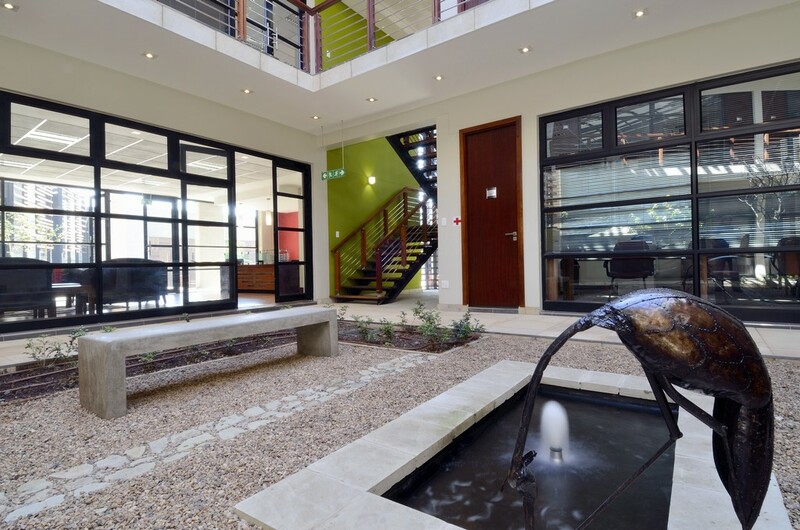 Rising heat is kept out of the lower volumes by introducing higher internal volumes and ventilating the roof spaces (Witbooi 2010). 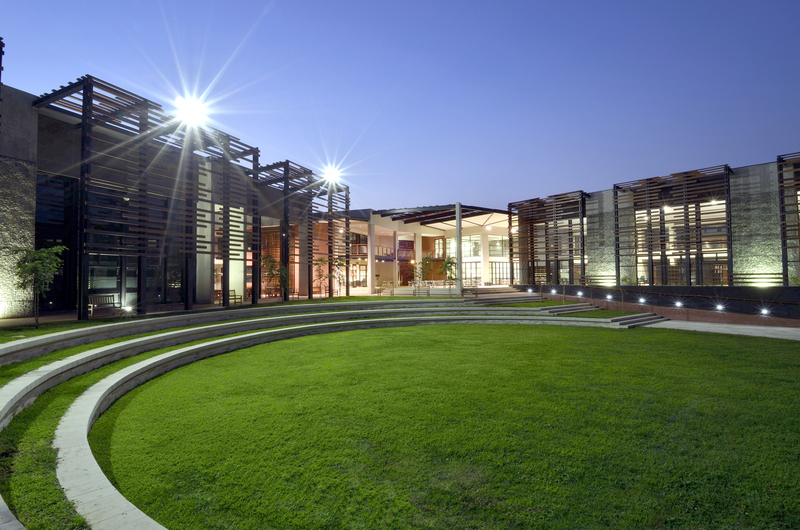 The glazed facades are protected from the sun by laminated pine lattices and creepers (Witbooi 2010). The large 2 500mm sheet metal mono pitch roofs channel rain water to the concrete gutters taking water to the storage tanks. This stored water serves to irrigate gardens and spays mist for cooling, giving a sense of tranquillity to the passages, the gardens and the amphitheatre (Witbooi 2010). 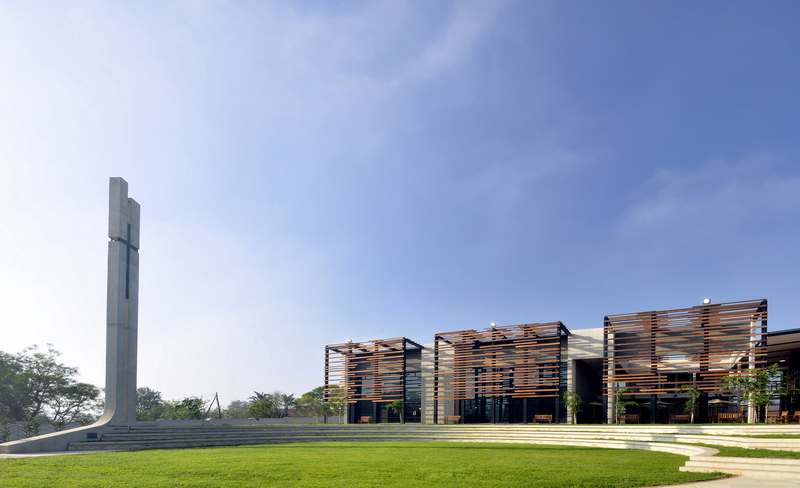 The architectural style can be described as contemporary modern with the classical concept of monumentalism- a direction Louis Kahn advocates. The large internal and external volumes and incorporation of natural lighting speaks of the classical intent of monumentality. This structure attempts to reconcile an African aesthetic with that of the modern- learning from other cultures and developing a contemporary African aesthetic acknowledgeable by the international community. This is an extraordinary project I’m really inspired, however the colour ‘blue’ is missing by the pulpit, understanding the symbolism of the colours used in the chapel in relation to the Blue, Purple and Red used in the tabernacle. Exodus 26:31. I wonder why?